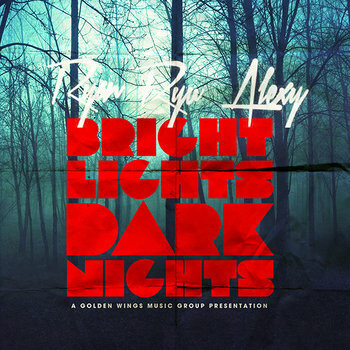 So I was checking the inbox again this morning and listening to some submissions and I came across this beat tape submission entitled “Bright Lights Dark Nights”. For those of you who know me, you already know that I’m not a big instrumental guy so for me to sign off on a beat it might be worth a listen. So I took a chance and listened to this beat tape because I know we had posted a song from an artist that he had worked with before by the name of KADDIE LAK. So here’s the reasons why you should listen to this new project by Ryan “Ryu” Alexy. I like how it starts out with that airy vocal sound in the background. That sound pretty much helps to set the vibe of the song. The bassline is steady but what you get throughout the beat is moments of change which keeps the listener entrapped. First of all QC is on, for those that’s not in the know that’s Charlotte, NC. I just love how he chose to flip Drake’s 5am in Toronto. The melody is pretty much the same but up and down sound has is in a different note. I do respect the fact that he put his own twist on it with the use of constant strain of the synth/keyboard near the end of the beat. You already know that I’m feelin that vocal sample. When the bass and drums come in your head will instantly start to bob. The intro set the pace and everything that followed added to the feel of the beat. The break during the beat was on par and is something you should want to hear from a lot of other producers as well. Well placed! I hate to compare him to somebody but this beat reminds me of something that Havoc and Alchemist would collab on. It has that demonic feel to it. Its the keys that create that melancholy vibe. That part where the bassline changes just screwed up my face so bad, sick. Start out strong and finish strong, that’s what good artist can do with persistence. This beat is not really complex. It’s the simplicity that makes it unique. I can’t help it but to compare it to something that you would hear on something like J Dilla’s Donuts. He lets the secondary instruments stand out with throwing in a bassline and heavy drums. It’s pure funk in my opinion. I am sincerely impressed by what I heard during my first listen. With 29 different beats its hard for every one of them to be a dime but I’m sure that you will find plenty of beats up there that you will enjoy listening to and possibly syncing to the pod. Hats off to Ryan Alexy for this contribution to the music word and shouts out to Kevin Chadway for sending this our way.